Spain’s Atletico Madrid are taking on a challenge tougher than winning La Liga ? developing football in cricket-mad Pakistan, where bat and ball are king, pitches come with stumps not goalposts, and even the prime minister is a former World Cup winner. During a recent session at the club’s new facility in Lahore ? the country’s first European football academy ? a cabal of Spanish coaches watched as a new class of young hopefuls fired off penalty kicks. “We are not looking for players for Atletico Madrid because we know that this is going to be very difficult… Our target is to improve the football here,” Coach Javier Visea said. To succeed in carving out a place for football, they will need to overcome marginal government support, poor infrastructure and a troubled history with FIFA that has resulted in multiple bans for violating the body’s rules. Pakistan remains on thin ice with the governing organisation, currently sitting at 199th in the FIFA rankings, and has still never qualified for a football World Cup. Cricket country: Things weren’t always so dire. The national squad boasted a top 10 place in Asian football until the 1970s. The sport remains widely watched by middle-class Pakistanis, and football video games like the FIFA franchise are as popular as ever. Those seeds of fandom are what Atletico hopes to nurture with their facility, which opened last September in the nation of over 200 million. “We know cricket is the main sport,” said Visea. “But … there are a lot of football fans, they are following (the) Premier League, they are following La Liga.” Atletico aims to promote football, health, and sports in general, he said ? along with their own brand in the vast untapped football market that is South Asia. And a promising future for football may not be as quixotic as it sounds. For decades, field hockey was the most popular sport in the country as Pakistan dominated international competitions and won four World Cup titles. The sport was only overshadowed by cricket, culminating in the 1992 World Cup win under Imran Khan’s stewardship. Cricket has ruled the sporting roost ever since ? but the hope is that another strong personality with a winning streak in football could change everything again. 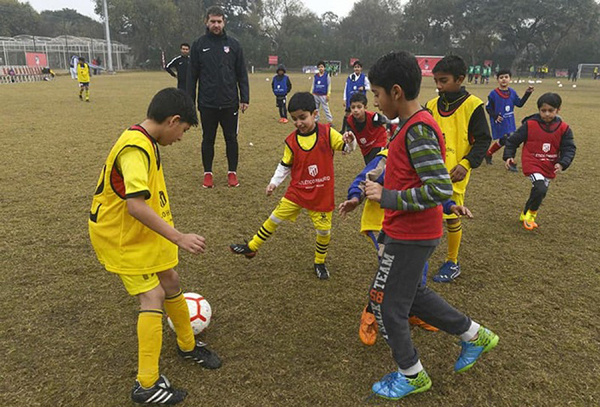 ‘A little bit scared’: Ten-year-old Fiza Shahid dreams of becoming a footballer like her heroes Lionel Messi and Cristiano Ronaldo, practising in her backyard before joining Atletico’s academy. As she sprinted down the new facility’s pitch, her father Muhammad Shahid said he takes great pride in watching his daughter play the beautiful game. Shahid, who is from a humble background and holds conservative beliefs, is a firm believer in his daughter’s right to play. “Both the sons and daughters have equal rights,” he said. The opening of the academy also comes as security has dramatically improved after years of militancy, paving the way for the gradual return of international sports. “At the moment they asked us about coming here we were a little bit scared because all the news coming from Pakistan to Spain (is) not good news,” said coach Daniel Limones. But things changed when he landed in Pakistan. “There is no security issue or those things,” he added.